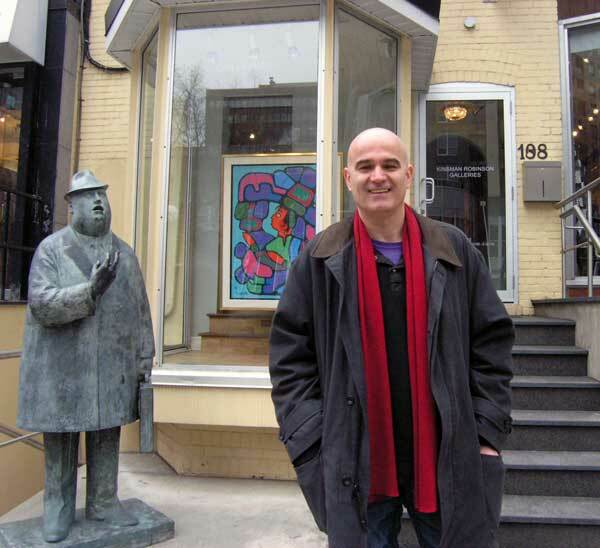 SLAPP suit Target Ugo Matulic, of Calgary, Alberta, outside Toronto’s Kinsman Robinson Galleries, is famous in Canadian history as the first person ever taken to court by the Morrisseau Conspiracy Theorists. Though the Conspiracy Theorists have had 13 years to take “thousands of forgeries and umpteen forgers” to court they have never done it, even once, knowing full well they have no believable independently verifiable evidence, of any kind, about forgers or forgeries, that will hold up in any court. Though Kinsman Robinson Galleries web blogs have personally accused Matulic of being an “ignorant Croatian,” Matulic is a shining example of how passionate new Canadians have immeasurably helped to enrich the cultural life of Canada. Cultural Genocide – Ugo Matulic has amassed what can only be called a stunning collection of compromising documentary evidence that catalogues the history of the biggest hoax, as well as the biggest act of cultural genocide, in Canadian history. Matulic, whose public-spirited generosity, in paying for dozens of expensive independent forensic analyses, by top independent Canadian forensic scientists, to analyze alleged “forgeries” – many belonging to other people, including strangers he did not know – has panicked the Conspiracy Theorists big time and caused them to take diabolical actions to try to stem the flow of damaging information that is unravelling their Hoax, big time. In 2010 Kinsman Robinson Galleries of Toronto launched a SLAPP suit against Matulic in Ontario Superior Court to try to shut him up and stop his public-spirited investigation into alleged frauds in the Morrisseau art market.